Aloe vera is a succulent plant with a long history of traditional uses and applications. It has left its mark on many civilisations: Egyptian, Greek, Hebrew, Indian and Chinese. Aloe vera juice comes from the sap found under the cuticle and skin of the leaf, whereas Aloe vera gel comes from the pulp – the mucilaginous tissue found in the centre of the leaf. It is important to distinguish between the two since they share neither the same chemical composition, nor the same properties or contraindications. The juice is the exudate from the cut leaf, while the gel is the mucilage obtained from the central part of the leaf. The juice, which is concentrated down through boiling, is used to treat major digestive disorders, but it is not without contraindications. It contains anthracene derivatives including aloin which has anti-fungal, antibacterial and antiviral properties, but most importantly, has a significant laxative effect too, which is highly irritating to the digestive tract. The gel is obtained by cutting the leaf lengthways. The mucilaginous pulp is scraped out and quickly treated to prevent oxidation. The gel is viscous and clear. 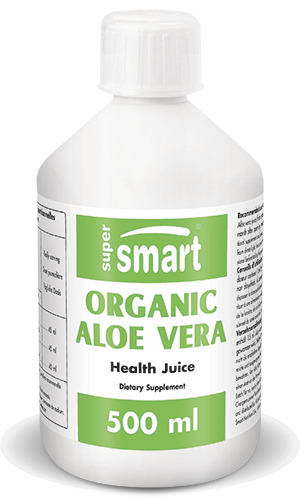 It does not have the same drawbacks as aloe juice because it is free from anthracene derivatives; on the contrary, it contains beneficial fatty acids, sterols, organic acids, phenols … all of which have a positive effect on the body. Read our article: how to use aloe vera daily. What benefits can be gained from consuming Aloe gel? A revitalising, tonic effect, related to the various nutrients it contains (amino acids, minerals, vitamins including folic acid and vitamin C …) producing an improved sense of well-being and an increase in the body’s resistance. Stronger immune and cardiovascular systems due to its powerful, free radical-quenching components which work in symbiosis with iron, potassium, magnesium, chromium and zinc. Relief of the chronic pain and inflammation experienced, in particular, by sports enthusiasts and as part of the ageing process. An antiviral effect due to the high polysaccharide content of the leaf’s mucilage which effectively forms a barrier against various types of virus. Some specific extracts have also given rise to medicines. Preservation of fibroblast activity and increased production of collagen and keratin in the skin, improving wound-healing and regeneration of the cutaneous tissue and cells of the epidermis. The skin thus looks healthier and younger-looking. A decrease in total lipid levels in individuals with raised cholesterol and a significantly reduced risk of developing blood clots. It is therefore a valuable ally of the cardiovascular system. And above all, in terms of digestion, a balancing and stabilising effect on gut microflora, acting in a similar way to probiotics, which it complements naturally. It also improves digestive absorption of nutrients. Indeed, clinical studies have shown it improves protein absorption in particular avoiding the need for specific digestive enzymes. It has a beneficial effect on the mucosa and walls of the intestines and thus reduces irritable bowel symptoms. Last but not least, it alleviates and even heals stomach ulcers. Unlike Aloe vera juice, consuming this mucilaginous gel, obtained from the heart of the leaf, does not irritate the gut because it does not contain aloin. adults. Take 3 measuring cap doses a day. Each measuring cap contains 15 ml of Aloe vera gel. Keep refrigerated and use within 1 month of opening.